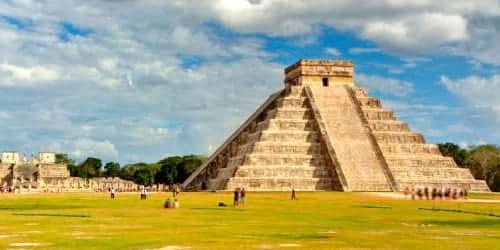 The ancient Mayan Civilization is known as one of the most important societies of Central America more than 2,000 years ago, mainly by their knowledge in astronomy, mathematics and hieroglyph writing. Today the remnants of the culture can be seen in the pyramids they left behind. Discover with us the Mayan Ruins in Cancun and learn more about this enigmatic civilization with our Cancun all-inclusive tours! 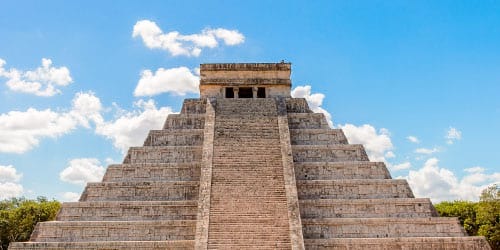 Your Chichen Itza Tour from Cancun is the gate to one of the new wonders of the modern world and one of the best daytrips from Cancun and Riviera Maya. 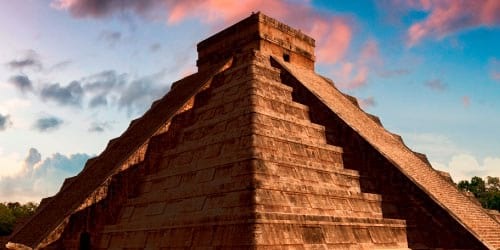 Perhaps the most iconic picture that comes to your mind when talking about the Mayan Ruins of Chichen Itza is the Temple of Kukulkan. Each of the temple´s 4 sides has 91 steps and the top platform makes the 365th, symbolizing a part of the Mayan calendar system called “Haab´”. Later, get ready to take a dive and cool of in the Cenote “Ik-kil” (Sinkhole), located just a few miles from the Chichen Itza Archeological Site. Get out of the beach and malls for a while and enjoy outdoor activities in Cancun & Riviera Maya. 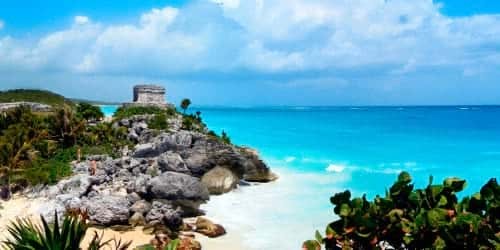 Book your tickets for Tulum Mayan Ruins and take a journey into the past to enrich your understanding about the Mayans. 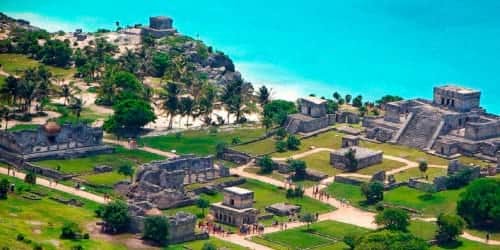 Known by some visitors as the “Egypt of the Americas”, Tulum Archeological Site is a pre-Columbian walled city used as a seaport for trading turquoise and jade. Don´t forget to take a photo with your significant others at the incredible pyramid “El Castillo” which stands on a 39 feet tall cliff facing the Caribbean Sea, voted by many visitors as one of the Top Tours to Mayan Ruins from Cancun. Your admission to the Mayan Ruins Tours from Cancun will include free transportation to and from your hotel to the ruins. Also, a certified instructor will guide through the whole journey, giving you unique facts about this enigmatic culture. We highly recommend you to bring comfort shoes, hat, sunglasses, biodegradable sun block and cash for any souvenir or beverages. Your Excursion to the Mayan Ruins near Cancun is just a click away. Book your tickets now and enjoy our package deals!